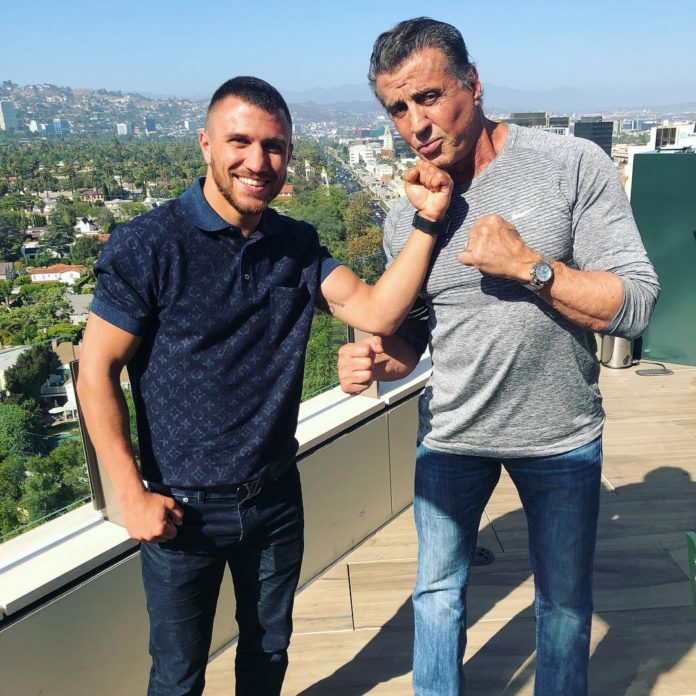 While the world highly anticipates the WBO welterweight title clash between the defending champion Jeff Horn and the mandatory opponent Terence Crawford held this weekend at MGM Grand in Las Vegas, Sylvester Stallone gives a shout-out to a boxing star out of Ukraine Vasyl Lomachenko. Rocky himself, calls the reigning WBA and The Ring magazine lightweight champion “the best pound for pound fighter in the world today”. “Had a great lunch with absolutely the best POUND OF [for] POUND fighter in the world today! The Ukrainian super champion VASILY LOMACHENKO, you should never missed one of his fights because he is truly the most supernatural boxer in the last half century, truly a born fighting machine! Absolutely amazing to watch, ” Stallone captioned the photo posted on Instagram on Thursday. Lomachenko is victorious in 11 out of 12 professional boxing bouts. He is riding the ten-fight win streak, with eight latest victories scored prior the final bell. In his most recent outing he TKO’d Jorge Linares in the tenth round, claiming World Boxing Association and The Ring Lightweight titles. Over the course of his amateur career Lomachenko won two World Championships in Baku and Milan, as well as took the first place at the European Championships in Liverpool. Furthermore, his resume includes two consecutive Olympic Gold medals in two different weight classes (featherweight and lightweight) earned in Beijing and London (respectively). Hollywood boxing icon Sylvester Stallone is expected to appear on Silver Screen on November 21 this year. This is when the second chapter of Creed is scheduled for release in the United States. In addition, Escape Plan 2 hits US theaters late this month. Had a great lunch with absolutely the best POUND OF POUND fighter in the world today! The Ukrainian super champion VASILY LOMACHENKO , you should never missed one of his fights because he is truly the most super natural boxer in the last half century, truly a born fighting machine! Absolutely amazing to watch!